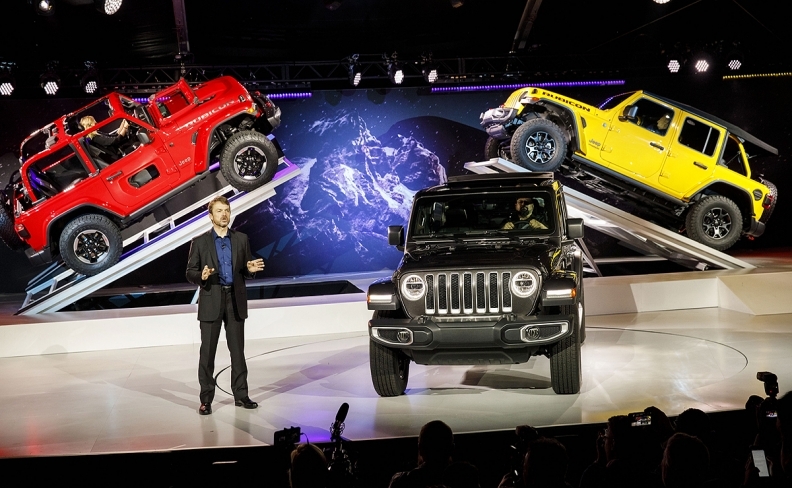 Jeep brand chief showed off the redesigned Wrangler at the Los Angeles auto show. DETROIT -- The engineers of the Jeep Wrangler had a conundrum: How do you redesign one of the most iconic SUVs on the road to survive tougher fuel economy standards without abandoning the brick-like shape that’s essential to its appeal? At first glance, the styling of the next-generation Wrangler doesn’t appear to have changed much. But a bend here and a curve there improved aerodynamics by 9 percent, according to Mike Manley, Jeep’s brand chief. “That’s not a small improvement for a vehicle of that style and shape,” Manley said in an interview. Subtle changes to the exterior, combined with lighter-weight materials and less fuel-thirsty powertrains, will “future-proof” Jeep’s direct descendant from rugged World War II battlefield vehicles, he said. It’s crucial to Fiat Chrysler Automobiles that Jeep engineers make their SUVs more efficient. While the lucrative brand is the crown jewel in Sergio Marchionne’s empire, Jeep is going to command the rich valuation that the deal-making CEO is looking for only if it has a credible plan for regulatory compliance. The Wrangler still has Jeep’s trademark seven-slot grille. But there’s now a subtle bend about two thirds of the way up that allows air to flow more efficiently over the face of the SUV and stay snug across the hood. Powering a car down the road is essentially like punching a hole in the air, said Brian Leyes, the Wrangler’s chief engineer. The vehicle’s size and shape determines the scale of the hole, and then aerodynamics affect how efficiently the vehicle gets through it. Design chief Mark Allen felt pressure to relent on the Wrangler’s vertically angled windshield, so he had a poster printed with a couple dozen images of Wranglers with progressively more slanted ones. He ran it by his team to spark conversations about just how far they could go before it would become too slanted. There was near total unanimity about where to draw the line. Fortuitously, the last acceptable angle was also the one that produced the best overall aerodynamics. The side mirrors of the 2018 aren’t any smaller than on the current model, but they are shaped -- in conjunction with the hood and windshield -- to allow air to pass by more smoothly. The ability to slip through air also is made a little easier by a slight taper in the Wrangler’s roof that makes it an inch or so narrower at the back than in the front. The rearmost pillar of the SUV is more rounded, compared with the previous model. And at the very back of that roof is a subtle, little spoiler called a lip spoiler. It smooths and directs the air flow to reduce turbulence. The Wrangler also got a little longer and wider. One benefit of that, relative to U.S. fuel economy rules, is that it lowers the bar for the model’s regulatory demands, which are based in part on the area covered by the vehicle. But if the standards for light trucks increase as set by the Obama Administration, the model will still face some challenges. Fiat Chrysler’s design changes and its new diesel and gasoline engines -- including the company’s first mass-produced mild hybrid -- should help lift the Wrangler’s average fuel economy by about a third, to 31 miles per gallon by 2021, according to Gopal Duleep, president of H-D Systems, a Washington, D.C.-based research company. That would still leave the company behind government targets, which for the Wrangler will jump to around 42 mpg by 2025, Duleep said. Adjusting for certain credits might bring the target down to about 38 mpg. Manley last month said that Jeep will offer a plug-in hybrid Wrangler in 2022. But hybrids haven’t sold well in truck-based SUVs, Duleep said, suggesting there may not be enough demand to lift the company’s average fuel economy by much. “They’re in a tough spot, no question about it,” he said.